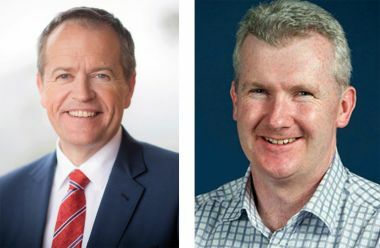 On behalf of the Federal Labor Party, we would like to convey our warmest wishes to Muslims in Australia and around the world who are observing the holy month of Ramadan. Ramadan is a month of deep spiritual reflection and an opportunity for Muslims to renew their faith in God through the teachings of the Quran. Ramadan commences at the sighting of the crescent moon and for 29 to 30 days, Muslims fast from dawn till dusk abstaining from food and drinks in a month of fasting, prayer and acts of charity. 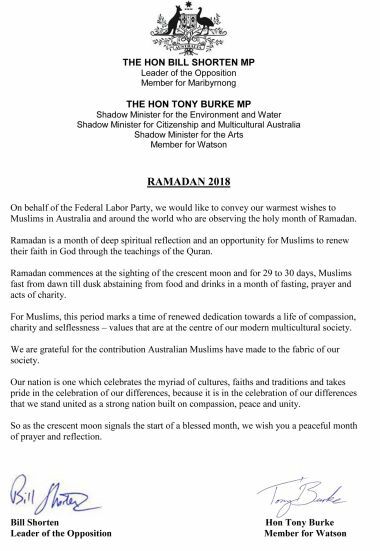 For Muslims, this period marks a time of renewed dedication towards a life of compassion, charity and selflessness – values that are at the centre of our modern multicultural society. We are grateful for the contribution Australian Muslims have made to the fabric of our society. Our nation is one which celebrates the myriad of cultures, faiths and traditions and takes pride in the celebration of our differences, because it is in the celebration of our differences that we stand united as a strong nation built on compassion, peace and unity. So as the crescent moon signals the start of a blessed month, we wish you a peaceful month of prayer and reflection.